Female Sympiesis, copyright Lyle J. Buss. We often imagine that parasites select their hosts largely on the basis of type: one parasite prefers caterpillars, for instance, while another prefers flies. However, sometimes what is important is not so much what type of host a parasite attacks, as where they find it. 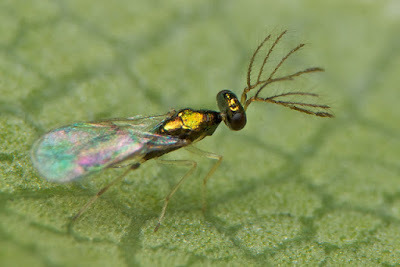 The wasp in the photo above represents Sympiesis, a sizeable genus (the Universal Chalcidoidea Database lists over 130 species) of microscopic parasitoid wasps found worldwide. The majority of Sympiesis larvae attack the larvae of Lepidoptera, but others feed on the larvae of Diptera. 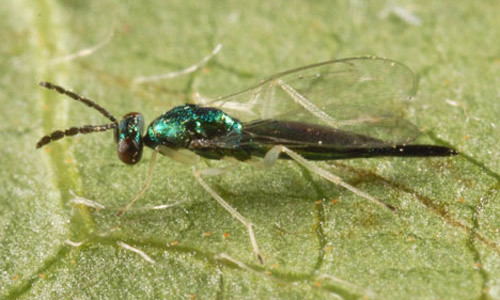 A few have been recorded as hyperparasitoids, attacking the larvae of other parasitic wasps. The main thing that all hosts of Sympiesis have in common, though, is that they are all found in secluded, vegetative habitats: either mining in leaves, or in retreats formed by rolling or tying leaves (sometimes boring in stems). Depending on species, Sympiesis larvae may be either ectoparasites or endoparasites: those species feeding on leaf-rolling hosts tend to be ectoparasites, while those targeting leaf-miners are endoparasites (Miller 1970). Sympiesis is a genus of the chalcid family Eulophidae. Eulophids used to be the subject of some disagreement between myself and a colleague of mine about their ease of recognition. Eulophids are a diverse group in appearance, coming in a bewildering array of shapes and colours. However, I have always maintained that they are nevertheless readily recognisable. Whatever their appearance, eulophids seem to always a distinctive stamp of 'eulophid-ness'. They tend to be slender, relatively soft-bodied wasps, often with a flat top to the gaster. Most identification guides will tell you to look out for their four-segmented tarsi (as opposed to the five-segmented tarsi of most other chalcid wasps); eulophid tarsi are rendered even more recognisable by the point that, though they have less segments than the tarsi of other chalcids, they are not any shorter so the individual tarsal segments are all relatively long. The features distinguishing Sympiesis from other eulophid genera are, of course, finer and require fairly close examination: notably, they have relatively few dorsal setae (only four on the scutellum) (Bouček 1988). As far as I know, they are mostly metallic green in coloration. Male Sympiesis, showing branched antennae, from here. As with many eulophids, males of Sympiesis usually differ from females in having long branches on the antennae. However, the first species of the genus to be described, the European Sympiesis sericeicornis, is distinctive in that these antennal branches are much reduced so that the males' antennae look little different from the females' (if you look very closely, they still have just a bit of a finger on each of the middle antennal segments). This led historically to a fair bit of confusion in the recognition of Sympiesis, with many species originally being placed in segregate genera (often with tongue-twistery compound names such as Asympiesiella or Sympiesonecremnus; thank you again, Alexandre Girault). Even now, the status of Sympiesis with regard to some related smaller genera could do with further investigation; we may yet see it grow again. Miller, C. D. 1970. The Nearctic species of Pnigalio and Sympiesis (Hymenoptera: Eulophidae). Memoirs of the Entomological Society of Canada 102 (Suppl. S68): 5–121.